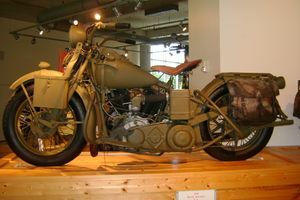 The U.S. Army's big twin model was the Harley-Davidson UA, an extra-low compression 74 cubic inch side valve with gearing appropriate for attaching a sidecar. The UA motor was built for only two years, 1939 and 1940. This machine features a Thompson submachine gun, the motorcycle's storage compartment holds a maximum of 10 clips (300 rounds) and one drum (50 rounds) of .45 caliber ammunition. This page was last edited on 11 August 2010, at 01:02.